Yesterday Donald Trumpspoke in front of a graduating class of US Coast Guard Cadets on what was possibly the proudest day of their lives. He then preceded to hijack the moment to whine about how unfairly he's been treated as President. Trump said: "Now I want to take this opportunity to give you some advice. Over the course of your life, you will find that things are not always fair. You will find that things happen to you that you do not deserve, and are not always warranted. "But you have to put your head down and fight, fight, fight. Never, ever, ever give up. Things will work out just fine. Look at the way I've been treated lately, especially by the media. 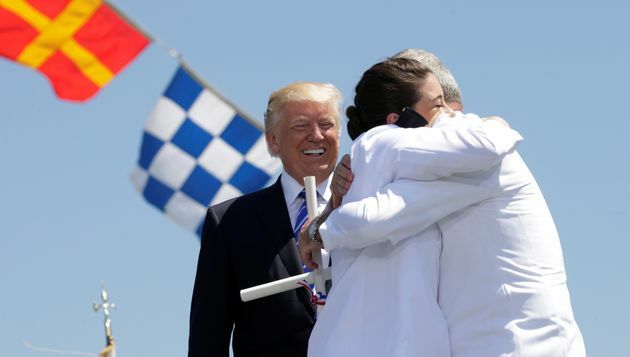 A graduate gets a hug from a relative as U.S. President Donald Trump smiles while attending the ceremony yesterday. "No politician in history, and I say this with great surety, has been treated worse or more unfairly. You can't let them get you down." Well, noted historian and son of legendary newsman, Dan Snow immediately took issue with that assertion, tweeting a number of case studies of politicians who did indeed appear to have a rougher time in office than Trump. After Oliver Cromwell died his corpse was exhumed, hung, drawn and quartered. For context, the President is complaining about the struggles of public scrutiny of potentially impeachable conduct. Trump is correct in one sense in that he is unique. No president in history has been embroiled in so much controversy so soon after taking office. His speech comes in a week in which it not only transpired he leaked disclosed classified intelligence to visiting Russian officials but also in February asked James Comey, then-FBI Director, to drop his investigation into links between the President's associates and Russia. Closer to home, others listed former presidents and US politicians who have certainly had a rougher time than Trump, mostly through no fault of their own. @thehistoryguy@Malena_Ernman Dutch politician Johan De Witt was lynched and eaten by an angry mob in the 1700th century. But surely Trump suffers worse treatment. The rest of Trump's speech was no better. The President continued: "The more righteous your cause, the more opposition you will face. I've accomplished a tremendous amount in a very short time as President." He then listed off his stock list of "accomplishments" including The Wall, which hasn't been built and might actually be a fence, voting to pass a healthcare act that will strip 24 million people of health insurance, and giving massive tax breaks to multi-billion pound corporations. He added: "And the people understand what I'm doing and that's the most important thing." Trump's approval rating is currently at an all-time low of 42% and that's before you even factor in the latest Comey/FBI/Russia scandal. The ongoing saga took another abrupt twist last night when the Justice Department abruptly appointed former FBI Director Robert Mueller to lead a federal investigation into allegations that Trump's campaign collaborated with Russia to sway the 2016 election that put him in the White House. The surprise announcement to hand the probe over to Mueller, a lawman with deep bipartisan respect, was a striking shift for Trump's Justice Department, which had resisted increasingly loud calls from Democrats for an outside prosecutor. It immediately escalated the legal stakes ― and the potential political damage ― for a president who has tried to dismiss the matter as partisan witch hunt and a "hoax," reports the Associated Press.